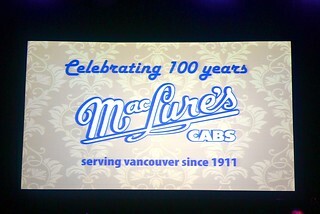 MacLure's Cabs 100th Anniversary party at CBC Vancouver on October 5, 2011. Photos by Jeremy Lim Photography. My travels as a social editor sometimes takes me to interesting places. 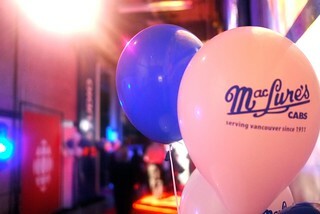 Case in point, I attended MacLure's 100th anniversary party celebrating 100 years in business. I had no idea they'd been around so long. CBC's basement studios were packed with mostly members of the Indo-Canadian community, NPA civic politicians looking for votes, representatives from the other local taxicab companies, and random friends. It was pretty decked out. It was pretty clear that the company was proud of its accomplishments and standing in the community. The party showed their pride in spades. The night's highlight was the male breakdancing group. I was surprised by the patrons generousity, throwing twenty dollar bills in tips for the dance crew. It was a fun night celebrating a longstanding member of our city's business community.